Purpose: This study explored whether Jian-Pi-Zhi-Dong-Decoction (JPZDD) could regulate the metabolism of glutamate (GLU) and its transporters in the striatum to exert anti-tics effects in Tourette syndrome (TS) rats. Materials and methods: We randomly assigned 56 Sprague Dawley rats into four groups, each with 14 rats: control, model, tiapride (Tia), and JPZDD. TS groups (model, Tia, and JPZDD) received intraperitoneal injection of 3,3'-iminodipropionitrile for 7 days to establish TS model. Thereafter, rats in the four groups were treated differently once a day for 6 weeks. Behavioral evaluation was performed each week by using stereotypy recording and autonomic activity test. The level of GLU in the striatum was examined by high-performance liquid chromatography. Expression of EAAT1 and VGLUT1 were measured by quantitative real-time PCR (qRT-PCR) and laser scanning confocal microscope. Results: Compared with the model group, the stereotypy score and autonomic activity were decreased in Tia and JPZDD groups. Notably, the model group had increased concentration of GLU, which decreased after JPZDD and Tia treatments. 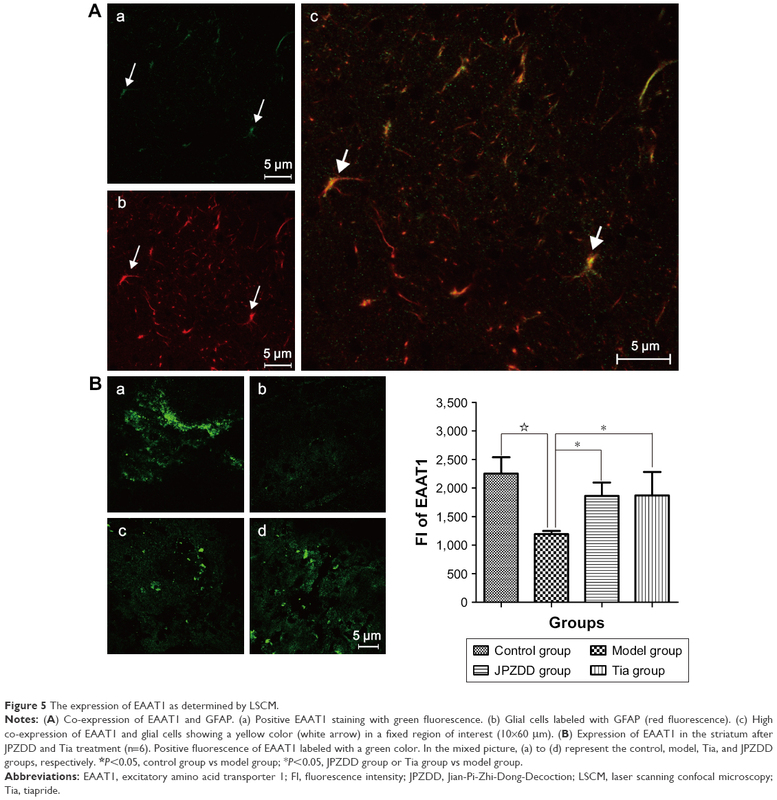 In the model group, EAAT1 and glial cells were highly co-expressed and the relative fluorescence intensity (FI) of EAAT1 was significantly lower than that in the control group. Treatment with JPZDD and Tia increased the relative FI of EAAT1. The mRNA level of EAAT1 decreased in the model group compared to that in the control group, although it was significantly elevated following JPZDD or Tia treatment. In the model group, there was low co-expression of VGLUT1 and axon cells and the FI of VGLUT1 was remarkably increased relative to that in the control group and reduced following treatment with JPZDD and Tia. A similar trend was observed in the mRNA and protein expression of VGLUT1, although it was not statistically significant. Conclusion: The mechanism by which JPZDD alleviated behavioral dysfunction of TS rats may be associated with maintaining normal GLU transport by upregulating EAAT1 and downregulating VGLUT1 in the striatum. Although malfunction of the cortico-striato-thalamocortical (CSTC) circuit, which is involved in sensorimotor, cognitive, and emotional functions,10 may be involved in the pathophysiological mechanism of TS, the exact mechanism remains unclear.11 Numerous neurotransmitters are involved in the complex interactions in this circuitry, including dopamine (DA), glutamate (GLU), and gamma-aminobutyric acid (GABA). Excessive dopaminergic transmission may cause TS, but this hypothesis cannot fully explain the entire range of clinical characteristics and other abnormalities of neurotransmission observed in TS patients.12 One suggested hypothesis is that if dopaminergic abnormalities occur, other neurotransmitter systems would be affected as well.13 The imbalance between excitatory glutamatergic and inhibitory GABAergic transmissions is thought to alter the development of brain networks and is associated with TS.13–15 Recently, a study on gene-set analysis proved this hypothesis by showing that altered GLU metabolism led to dysfunction of astrocyte–neuron metabolic coupling (ANMC) in TS.16 The synthesis of glutamate occurs in the cytosol, which is then transported by vesicular glutamate transporters (VGLUTs) to synaptic vesicles for storage, and is released to the synaptic cleft through exocytosis.17 Excessive concentration of this amino acid in the synaptic cleft results in neuronal excitotoxicity.18 To maintain the concentration of GLU below the excitotoxic level, GLU in the synaptic cleft is recycled by excitatory amino acid transporters (EAATs) located in neurons and glia cells.13,17 Within glial cells, glutamate is catabolized to glutamine, translocated into neurons, and metabolized back to glutamate and taken up by VGLUTs into synaptic vesicles (Figure 1).17,19 During the recycling of GLU, glutamate transporters play the role of maintaining the extracellular GLU level in the normal concentration. Hence, dysfunctional transporters may result in high GLU levels in the synaptic cleft causing aberrant excitatory transmission and synaptic plasticity that contribute to behavioral disorders such as tics. Yet, whether glutamate transporters (VGLUTs and EAATs) are involved in the pathophysiological process of TS is unclear and needs to be further explored. Figure 1 Simple diagram of glutamate transport. Notes: GLU released by vesicular exocytosis is uptaken from synaptic cleft by EAAT1, which is metabolized to GLN through the action of glutamate synthase. GLN then is transported back into neurons, converted to GLU through the action of glutaminase, and sequestered into synaptic vesicles by VGLUT1. Abbreviations: EAAT1, excitatory amino acid transporter 1; GLN, glutamine; GLU, glutamate; VGLUT1, vesicular glutamate transporter 1. Traditional Chinese medicine (TCM) classic prescription “Xie Qing Wan” was first described by the Chinese ancient pediatrician Qian Yi from “Key to Therapeutic of Children’s Disease” in Song dynasty (AD 1114). Jian-Pi-Zhi-Dong-Decoction (JPZDD) was evolved from “Xie Qing Wan”, which was recorded to treat the symptom of eye blinking, one of the main symptoms of TS. JPZDD had been used to treat TS for decades, which possesses anti-tic properties as reported in clinical20 and animal studies.21,22 Previously, microdialysis revealed that the basal striatal level of GLU increased in a rat model of TS, which decreased after JPZDD treatment.23 Whether JPZDD exerts anti-tics pharmacological effects by reducing the GLU level through glutamate transporters is not known. Hence, the goal of the present study was to explore the effect of JPZDD on the glutamate system in a TS rat model, including the level of glutamate neurotransmitter and expression of its transporters. The GLU level and expression of glutamate transporters EAAT1 and VGLUT1 were detected using high-performance liquid chromatography (HPLC), quantitative real-time PCR (qRT-PCR), and laser scanning confocal microscopy (LSCM). The JPZDD formulation comprise 10 different herbs used in Chinese medicines;21,23 the specific ingredients and dosages of JPZDD are as follows: Pseudostellaria heterophylla 10 g, Atractylodes macrocephala Koidz 10 g, Poria cocos Wolf 10 g, Angelica sinensis Diels 10 g, Uncaria rhynchopylla Jacks 10 g, Pinellia ternata Breit 6 g, Citrus reticulata Blanco 6 g, Saposhnikovia divaricata Schischk 6 g, Ligusticum chuanxiong Hort 6 g, and Gentiana scabra Bge 3 g. According to our previous studies,21,22 the herb extracts were obtained from the Pharmaceutical Preparation Section of Dongfang Hospital affiliated to Beijing University of Chinese Medicine to maintain quality consistency. The JPZDD granules were prepared as follows: herbs were decocted with distilled water for 2 hours after soaking for 1 hour at room temperature. Thereafter, a vacuum desiccator was used to condense and dry the filtrate at 60°C. Analysis of the granules obtained was performed by infrared fingerprint, and comparison against the standards was done to ensure the desired quality of ≥90%. After that, they were packaged into granules using the technology of Chinese medicine formula and stored at room temperature. The granules were dissolved in pure water (50 mL) using a magnetic stirring apparatus and then kept at 4°C refrigerator for use. A total of 56 healthy male Sprague Dawley rats (SPF grade) weighting 40–60 g were obtained from Beijing Vital River Laboratory Animal Technology Co., Ltd. (Beijing, China; No SCXK 2012–0001). All rats were housed under the following conditions: relative humidity (35%±5%), a stable temperature (21°C±1°C), and a 12-hour light/dark cycle environment with free access to food and water. This study was approved by the animal ethics committee of Dongzhimen Hospital of Beijing University of Chinese Medicine. All rats were handled in accordance with the Animal Management Rules of the Chinese Ministry of Health. All animals were acclimatized for 1 week before experiments. Initially, 14 rats were assigned to the control group and 42 rats were assigned to the TS group by random number table. In the control group, rats were injected intraperitoneally with 0.9% sodium chloride (NS) at a dose of 15 mL/kg. In the TS group, rats were administrated through intraperitoneal injection with 3,3′-iminodipropionitrile (IDPN; 317306; Sigma-Aldrich Co., St Louis, MO, USA, USA) with a dosage of 250 mg/(kg·d) for 7 consecutive days. Based on the behavioral evaluation using the grades of stereotype as described in previous studies,21,22 rats that met the TS criteria were subsequently allocated into three groups: model (n=14), JPZDD (n=14), and tiapride (Tia; n=14). Rats in the model and control groups were gavaged with 0.9% NS (10 mL/kg), those in the JPZDD group with JPZDD (16 g/kg), and those in the Tia group with Tia (21 mg/kg), which was purchased from Jiangsu Nhwa Pharmaceutical Co., Ltd. (Xuzhou, China). In all groups, administration of drugs was performed once per day for 6 weeks consecutively. Stereotyped behavior scores of rats were recorded by two skilled independent examiners who were blinded to the allocation of groups. According to the evaluation criteria of stereotypy,21 each rat was assessed for 2 minutes each week. The scores were averaged and used for statistical analysis. Assessment of autonomic activity of rats was performed using the spontaneous activity video analysis system (Shanghai Jixing Software Technology, Shanghai, China), which automatically recorded the motion trial of rats through four activity boxes. The sequence of testing of the rats was random. The environment of the activity box was shade and quiet. Prior to recording, rats were allowed 3 minutes to acclimatize and stabilize to the recoding conditions, and then, recording was done for 5 minutes. The total distance of spontaneous activity in each rat was automatically collected to determine the autonomic activity as the objective indicator. Cerebral tissue from four experimental groups (n=8 each group) was homogenized by electric homogenizer in 0.35 mL ice-cold working buffer (a fluid containing a mixture of o-phthalaldehyde 27 mg, anhydrous ethanol 1 mL, borate buffer 9 mL, and β-mercaptoethanol 5 μL). Supernatants were obtained by centrifugation of the homogenates at 14,000× g for 15 minutes, filtration using the centrifugal clarifier (Spin-X, 0.22 μm; Corning Incorporated, Corning, NY, USA) at 7,000 rpm, and diluting 10-folds by 0.05 M perchloric acid to form the final test samples (20 μL in each sample). The concentration of GLU in the striatum was detected by HPLC (Model 5600A Coularray Detector-8; ESA Inc, Chelmsford, MA, USA) using the following detecting conditions: the pre-column (Capcell C18 MG S-5, 4.0×10 mm; Shiseido Co., Ltd, Tokyo, Japan) and chromatographic column (Part#186000598, 3.0×50 mm, 2.5 μm; XTerra; Waters Corporation, Milford, MA, USA). The mobile phase consisted of 100 mM sodium hydrogen phosphate, 25% methyl alcohol, 10% acetonitrile, and phosphoric acid, which was used to adjust pH value to 6.70. The flow velocity was 0.6 mL/min, the column temperature was 40°C, and the electric potentials were set as 150 and 550 mV. The relative concentration of GLU was automatically calculated by the ESA software. After 6 weeks of treatment, six rats from each group were sacrificed under the state of anesthesia by injection of 3.5% chloral hydrate (10 mL/kg, intraperitoneal). Subsequently, the global brains were fixed in 4% paraformaldehyde for 24 hours, dehydrated by 30% sucrose for 24 hours, and cut into 30-μm-thick frozen sections by a refrigerated microtome (CM1900; Leica Microsystems, Wetzlar, Germany). The sections were immersed in boiling citrate buffer (15 minutes) for antigen retrieval and then in the PBST medium at room temperature (30 minutes) to improve permeability. Next, they were blocked with a nonspecific antibody in 5% goat serum (ZLI-9021; Zsbio, Beijing, China) for 2 hours and then incubated overnight at 4°C with rabbit anti-Rat VGLUT1 (1:80, ab104898; Abcam, Cambridge, UK) mixed with mouse anti-rabbit Tau46 (1:80, 4019; Cell Signaling Technology, Inc., Danvers, MA, USA) and rabbit anti-Rat EAAT1 (1:80, ab416; Abcam mixed with mouse anti-rabbit GFAP (1:80, MAB360; EMD Millipore, Billerica, MA, USA) diluted in goat serum (ZLI-9021; Zsbio). After that, the sections were processed with fluorescent secondary antibodies at room temperature for 1 hour: rhodamine (TRITC)-conjugated goat anti-mouse IgG (H+L; 1:100, ZF-0313; Zsbio) and fluorescein (FITC)-conjugated goat anti-rabbit IgG (H+L; 1:100, ZF-0311; Zsbio). The DAPI solution was used to stain the nucleus in the tissue sections. Following coloration, the sections were mounted by Fluoromount-G™ (36307ES08; Shanghai Yeasen Biotechnology Co., Ltd., Shanghai, China) and stored at 4°C for microscopic examination. The laser scanning confocal microscope (FV1200; Olympus Corporation, Tokyo, Japan) was used for image recording and analysis of the sections. Striatal tissues (n=8 in each group) were used to extract total RNA using the Ultrapure RNA Kit (CW0581; Cwbio, Beijing, China), which utilizes the modified TRIzon method by use of centrifugal spin columns. Agarose gel electrophoresis and a spectrophotometer (260/280 ratio; Nanogrop 2000; Thermo Fisher Scientific, Waltham, MA, USA) were used to determine the quality and quantity of the isolated RNA. The HiFi-MMLV cDNA Kit (CW0744; CWBio) was applied to synthesize first-strand cDNA at the following conditions: 42°C for 50 minutes and 85°C for 5 minutes. In all, 20 μL of the cDNA was amplified by PCR using the UltraSYBR Mixture kit (CW0957; CWBio) based on the following procedure: first step at 95°C for 10 minutes, second step at 95°C for 15 seconds, and third step at 60°C for 60 seconds (total 45 cycles). All primers were procured from Sangon Biotech (Shanghai, China): EAAT1 (forward 5′-GCCATCATGAGATTGGTAGCGGT-3′, reverse 5′-GGAAGTAGAGGAGAGGCAGGACGA-3′), VGLUT1 (forward 5′-CCTTCAGCAGCCCGTGT-3′, reverse 5′-GCCAGCCGACTCCGTTC-3′), and GADPH (forward 5′-TGGAGTCTACTACTGGCGTCTT-3′, reverse 5′-TGTCATATTTCTCGTGGTTCA-3′). The PCR experiments were carried out in Real-Time PCR System (ABI7500; Thermo Fisher Scientific), and assessment of mRNA levels was determined by the 2−ΔΔCt method. Data analysis was performed using IBM SPSS 20.0 software. All values were presented as mean±SD, and differences between groups were tested using one-way ANOVA with the Dunnett’s post hoc test after determining the normal distribution (Kolmogorov–Smirnov test) and homogeneity for variance (Levene’s test) or independent-samples Kruskal–Wallis test when equal variance was not assumed. Differences were considered to be statistically significant when P was <0.05. Compared to the control group intervened with normal saline, administration of IDPN for 7 days elicited a significant stereotyped behavior in the model, JPZDD, and Tia groups, which were not statistically significant before treatment. 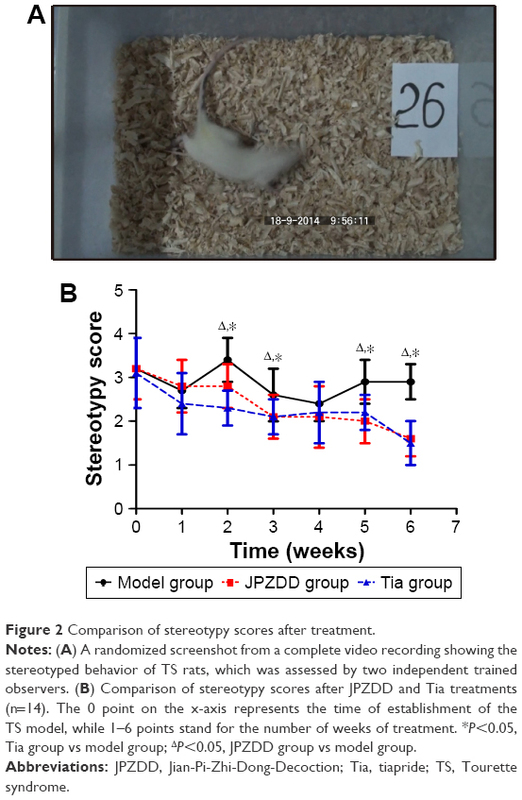 The stereotypy score in Tia and JPZDD groups gradually decreased during the treatment process, but the stereotypy score in the model group remained at a high level. As shown in Figure 2, after 6 weeks of treatment, the levels of stereotyped behavior were remarkedly decreased in the Tia group (P=0.000<0.05) and JPZDD group (P=0.000<0.05) as compared to the model group (df=2, F-value=39.608, P-value=0.000), but they were not statistically significant in the Tia and JPZDD groups (P=0.386>0.05). Figure 2 Comparison of stereotypy scores after treatment. Notes: (A) A randomized screenshot from a complete video recording showing the stereotyped behavior of TS rats, which was assessed by two independent trained observers. (B) Comparison of stereotypy scores after JPZDD and Tia treatments (n=14). The 0 point on the x-axis represents the time of establishment of the TS model, while 1–6 points stand for the number of weeks of treatment. *P<0.05, Tia group vs model group; ΔP<0.05, JPZDD group vs model group. Abbreviations: JPZDD, Jian-Pi-Zhi-Dong-Decoction; Tia, tiapride; TS, Tourette syndrome. Administration of IDPN for 7 days elicited a marked increase in the total distance of autonomic activity in the TS groups (model, Tia, and JPZDD groups) as compared with the control group (P<0.05). Prolonged treatment gradually attenuated the total distance of autonomic activity only in JPZDD and Tia groups but not in the model group. After 6 weeks of intervention, the total distance of autonomic activity in the JPZDD group (17.9±7.7 m, P=0.000<0.05) and Tia group (19.1±8.3 m, P=0.000<0.05) was remarkably reduced relative to that in the model group (34.0±5.1 m; df=3, F-value=30.592, P-value=0.000). However, the difference between the JPZDD and Tia groups was not significant (P=0.615>0.05; Figure 3). Figure 3 Comparison of autonomic activity after treatment. Notes: (A) A randomized screenshot from one complete video data from two independent test boxes showing the evaluation process of autonomic activity in SD rats, in which the total distance of autonomic activity was recorded according to its movements. (B) Comparison of autonomic activity after JPZDD and Tia treatments (n=14). The 0 point on the x-axis stands for the time of establishment of the TS model, while 1–6 points stand for the number of weeks of treatment. ☆P<0.05, control group vs model group; ΔP<0.05, JPZDD group vs model group; *P<0.05, Tia group vs model group. Abbreviations: JPZDD, Jian-Pi-Zhi-Dong-Decoction; SD, Sprague Dawley; Tia, tiapride; TS, Tourette syndrome. The concentration of GLU was notably higher in the model group (21.68±2.64 μg/mL) than in the control group (18.71±3.10 μg/mL, P=0.016<0.05). However, the concentration of GLU was markedly reduced following JPZDD (18.37±1.57 μg/mL, P=0.008<0.01) or Tia (16.10±1.62 μg/mL, P=0.000<0.01) treatment relative to that in the model group (df=3, F-value=7.762, P-value=0.001; Figure 4). Figure 4 Comparison of GLU level in the striatum. Notes: (A) HPLC analysis of amino acids in the striatum: GLU, Gln, Gly, Tau, and GABA appeared in that order. (B) Comparison of glutamate concentration in the striatum after JPZDD and Tia treatments (n=8). ☆P<0.05, control group vs model group; #P<0.01, JPZDD or Tia group vs model group. Abbreviations: FI, fluorescence intensity; GABA, γ-aminobutyric acid; Gln, glutamine; Gly, glycine; GLU, glutamate; HPLC, high-performance liquid chromatography; JPZDD, Jian-Pi-Zhi-Dong-Decoction; Tau, taurine; Tia, tiapride. As shown in Figure 5A, the protein expression of EAAT1 was represented by a green fluorescence, while the expression of glial cells labeled with GFAP was represented by a red fluorescence. Co-expression of EAAT1 and glial cells was represented with a yellow fluorescence. The relative fluorescence intensity (FI) is often used to indicate alterations in the expression of various proteins. As depicted in Figure 5B, the FI of EAAT1 in the model group was obviously reduced as compared to that in the control group (P=0.000<0.05) but increased remarkably after 6 weeks of treatment in Tia (P=0.044<0.05) and JPZDD (P=0.024<0.05) groups when compared with that in the model group (df=3, F-value=12.688, P-value=0.000). Figure 5 The expression of EAAT1 as determined by LSCM. Notes: (A) Co-expression of EAAT1 and GFAP. (a) Positive EAAT1 staining with green fluorescence. (b) Glial cells labeled with GFAP (red fluorescence). (c) High co-expression of EAAT1 and glial cells showing a yellow color (white arrow) in a fixed region of interest (10×60 μm). (B) Expression of EAAT1 in the striatum after JPZDD and Tia treatment (n=6). Positive fluorescence of EAAT1 labeled with a green color. In the mixed picture, (a) to (d) represent the control, model, Tia, and JPZDD groups, respectively. ☆P<0.05, control group vs model group; *P<0.05, JPZDD group or Tia group vs model group. Abbreviations: EAAT1, excitatory amino acid transporter 1; FI, fluorescence intensity; JPZDD, Jian-Pi-Zhi-Dong-Decoction; LSCM, laser scanning confocal microscopy; Tia, tiapride. As shown in Figure 6A, the protein expression of VGLUT1 was represented by a green fluorescence, while the expression of axon cells labeled with Tau46 was represented by a red fluorescence. The intensity of yellow fluorescence for VGLUT1 and axon cells was little, implying low co-expression. As depicted in Figure 6B, the FI of VGLUT1 in the model group was significantly increased relative to that in the control group (P=0.000<0.05). However, the FI of VGLUT1 in the JPZDD (P=0.000<0.05) and Tia (P=0.001<0.05) groups was markedly lower than that in the model group (df=3, F-value=11.394, P-value=0.000). Figure 6 The expression of VGLUT1 as determined by LSCM. Notes: (A) Co-expression of VGLUT1 and Tau46. (a) VGLUT1 expression showing a green fluorescence. (b) Axon cells labeled with Tau46 showing a red fluorescence. (c) Low co-expression of VGLUT1 with axon cells observed as a yellow color (white arrow) in a fixed region of interest (10×60 μm). (B) Expression of VGLUT1 in the striatum after JPZDD and Tia treatment (n=6). Positive fluorescence of VGLUT1 expression showing a green color. In the mixed picture, (a) to (d) stand for the control, model, Tia, and JPZDD groups, respectively. ☆P<0.05, control group vs model group; *P<0.05, JPZDD group or Tia group vs model group. Abbreviations: FI, fluorescence intensity; JPZDD, Jian-Pi-Zhi-Dong-Decoction; LSCM, laser scanning confocal microscopy; Tia, tiapride; VGLUT1, vesicular glutamate transporter 1. The mRNA expression of EAAT1 was lower in the model group than that in the control group (P=0.000<0.05). However, the EAAT1 mRNA level dramatically increased after treatment with JPZDD (P=0.033<0.05) or Tia (P=0.020<0.05) when compared with that in the model group (df=3, F-value=5.609, P-value=0.004). On the other hand, the mRNA expression of VGLUT1 was higher in the model group than that in the control group, although it was not statistically significant (P=0.608>0.05). The mRNA level of VGLUT1 in JPZDD (P=0.813>0.05) and Tia (P=0.641>0.05) groups did not significantly differ from that in the model group (df=3, F-value=0.114, P-value=0.951), although its expression level decreased in the two treatment groups (Figure 7). Figure 7 The mRNA expression of EAAT1 and VGLUT1 after treatment. Notes: (A) Comparison of mRNA expression of EAAT1 after JPZDD and Tia treatments (n=8). 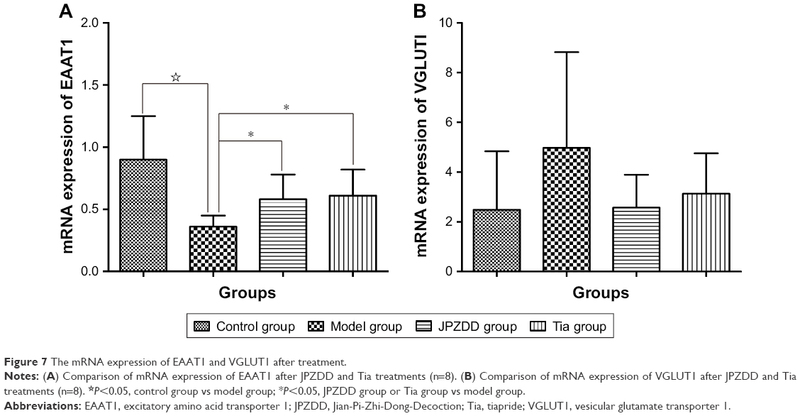 (B) Comparison of mRNA expression of VGLUT1 after JPZDD and Tia treatments (n=8). ☆P<0.05, control group vs model group; *P<0.05, JPZDD group or Tia group vs model group. Abbreviations: EAAT1, excitatory amino acid transporter 1; JPZDD, Jian-Pi-Zhi-Dong-Decoction; Tia, tiapride; VGLUT1, vesicular glutamate transporter 1. The pivotal relation between dysfunctional metabolism of synaptic neurotransmission in the CSTC circuitry24 and the pathogenesis of TS has always been the hotspot of research, and a recent study found that TS patients exhibit an abnormality in the metabolites of glutamate-related neurotransmission,25 but only few studies have examined the aberrant expression of glutamate transporters in TS. Thus, the goal of the present study was to explore the influence of the GLU system on the pathophysiological development of TS, including the level of glutamate neurotransmitter and expression of its transporters after pharmaceutical intervention. The choice of animal model is an important factor in the study of the pathogenesis of diseases and for exploring new therapeutic targets to improve the treatment of patients.26 In this study, a TS rat model was developed by intraperitoneal injection with IDPN to produce a stable stereotyped behavior, as described previously.27–29 The severity of tics was evaluated and categorized into 5-point scales ranging from normal activity to the most severe stereotypy.21 The total distance of autonomic activity recorded by the spontaneous activity video system was used to objectively reflect the excitability of rats. Our results showed that the model and treatment groups (JPZDD and Tia) had similar stereotyped scores after injection of IDPN for 7 consecutive days. After 6 weeks of treatment, the stereotyped score was significantly reduced in Tia and JPZDD groups relative to that in the model group. Meanwhile, after administration of IDPN for 7 days, the total distance of rats’ autonomic activity was longer than that of the control group. 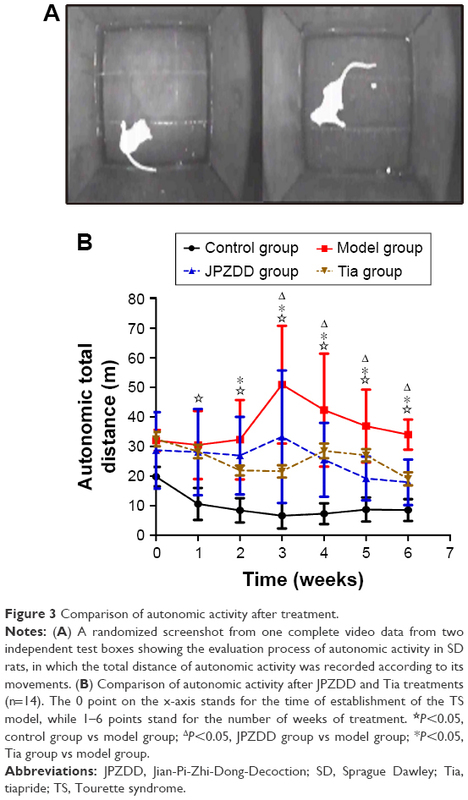 After gavaging with JPZDD and Tia for 6 weeks, the total distance of autonomic activity in the Tia and JPZDD groups decreased compared to that in the model group, which showed no significant change. Since it is a predominant excitatory neurotransmitter of the brain, GLU plays a major role in both neuroplasticity (normal function) and excitotoxicity (abnormal function).30 In the central nervous system, glutamate excitotoxicity is associated with chronic neurodegenerative and behavioral disorders such as Parkinson’s disease, amyotrophic lateral sclerosis (ALS),31 and schizophrenia.32 However, unlike the pathological role of glutamate in the degenerative diseases such as Parkinson and ALS mentioned earlier, the explicit mechanism of glutamate in the pathogenesis of TS needs to be further explored because of TS not a degenerative disease.33 HPLC is a chromatographic technique that is used to separate, identify, and quantify constituents of a biological sample such as amino acids.34,35 The results of HPLC assay showed that the content of GLU in the corpus striatum was elevated in the model group relative to that in the control group. Furthermore, we found that treatment with JPZDD and Tia for 6 weeks could remarkably decrease the expression level of GLU. The in vitro experimental results of GLU expression were consistent with our previous findings from a microdialysis study in vivo.23 One clinical study found that the serum concentration of glutamate in TS patients was elevated, which suggests that glutamate may be associated with the progress of TS.36 The present study confirmed that a high expression of GLU was involved in the pathophysiological process of TS and intervention with JPZDD and Tia restored the normal GLU level. 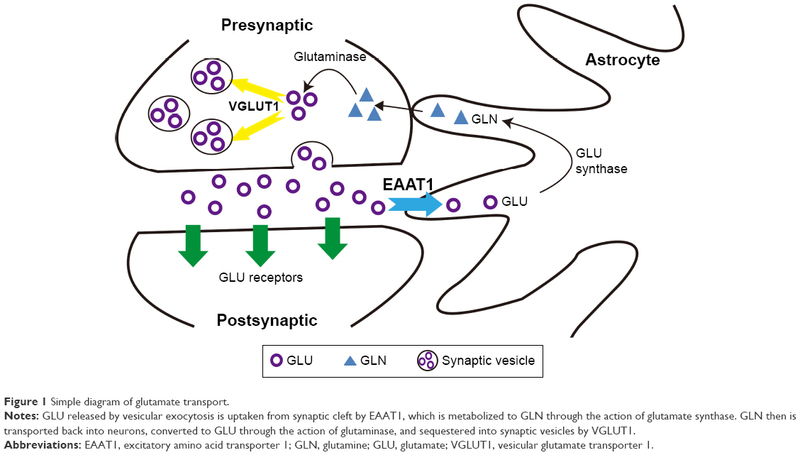 The concentration of GLU in the synaptic cleft is regulated by EAATs that increase GLU reuptake and VGLUTs that mediate the exocytotic release of GLU.37 Abnormalities in expression of EAATs and VGLUTs lead to abnormal clearance of extracellular GLU, which results in GLU accumulation in the synaptic space, and further activation of glutamate receptors and excitatory transmission through downstream signaling, which culminates in neuropsychiatric disorders.38,39 The modern laser scanning confocal microscope is widely used to detect multiple fluorophores simultaneously and for data analysis.40 Our results showed that EAAT1 was highly co-expressed with glial cells labeled with GFAP, which is consistent with results of a previous study.41 VGLUT1 was weakly co-expressed with axonal cells labeled with Tau46, and this is likely caused by the predominant expression of VGLUT1 in the presynaptic membranes42 that represent a small part of the axonal cells labeled with Tau46. In comparison with the control group, the relative FI of EAAT1 in the model group was markedly decreased, and this effect was reversed following treatment with JPZDD and Tia. The FI level of VGLUT1 in the model group was notably higher than that in the control group, but it was reduced following the treatment with Tia and JPZDD. Real-time PCR is a highly sensitivity and specificity technique used to measure RNA expression levels.43 Here, we found that mRNA level of EAAT1 was significantly reduced in rats 6 weeks after IDPN injection; JPZDD and Tia treatments could remarkably increase its expression. Similar results were observed in the protein expression of EAAT1 as detected by LSCM. The mRNA expression of VGLUT1 was not significantly different among the groups, although its mRNA level was elevated in the model group. Treatment with JPZDD and Tia decreased VGLUT1 expression at the protein level although its mRNA levels were not different among the groups. EAAT1 is a member of glutamate transporters family that was first cloned in 1992,44 which functions as a glial transporter that regulates glutamate reuptake from the synaptic cleft.45 Dysfunctional EAATs cause abnormal excitatory synaptic transmission and neuronal excitotoxicity, which are implicated in many neurodegenerative and neurological diseases.46 Evidence from previous genome scans links TS to 5p13, a region that encodes the glial GLU transporter gene 1 (SLCA13/EAAT1).47,48 A recent study demonstrated that various types of EAAT1 knockout models mimic many aspects of the behavioral abnormalities such as schizophrenia, obsessive-compulsive disorders, autism, epilepsy, and addiction.49 The present study found that EAAT1 was highly co-expressed with the glial cells. Hence, dysfunction of EAAT1 may explain the high level of GLU in the TS model. In this study, the high mRNA and protein expression of EAAT1 led to decreased GLU levels in the treatment groups (JPZDD and Tia). On the other hand, VGLUT1 (a small family of VGLUTs) regulates transmitter release probability, synaptic plasticity, and reserved pool of vesicles.50,51 Dysfunction in VGLUT1 has been reported in some neurodegenerative and neurological diseases with classic excitatory symptoms, such as Parkinson’s disease52 and schizophrenia.53 However, whether VGLUT1 participates in the pathological mechanism of TS is still unclear. The present study confirmed that the protein expression of VGLUT1 was remarkably elevated in the TS rat model, and it was reduced after therapeutic interventions (JPZDD and Tia) for 6 weeks. The mRNA expression of VGLUT1 showed a similar trend with protein levels, although there was no statistical significance among the groups. 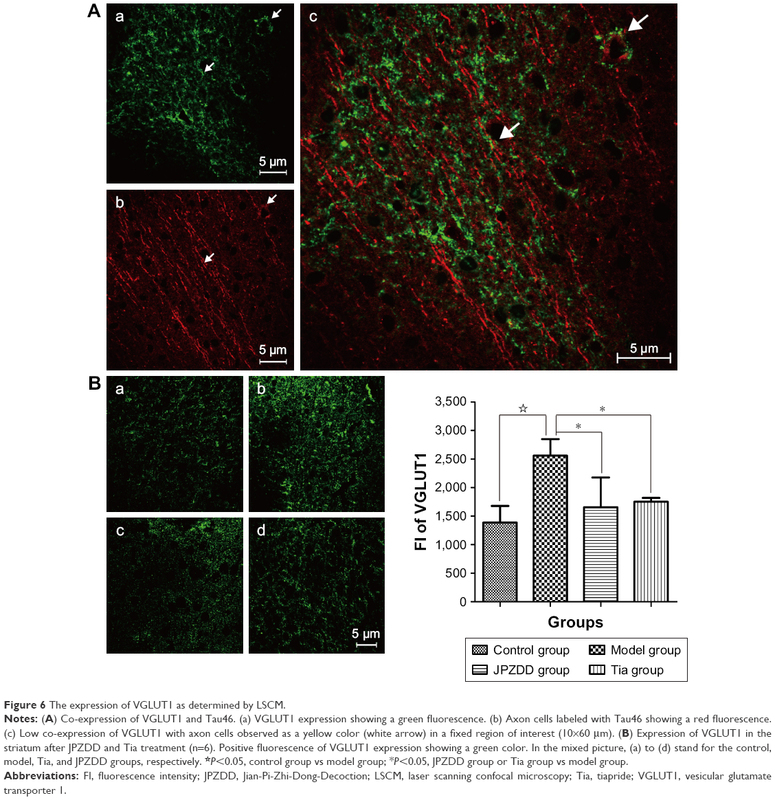 Increased expression of VGLUT1 raised the concentration of GLU in synaptic vesicles and its release into the synaptic cleft through exocytosis, leading to a high concentration of GLU in the striatum. The hypothesis of a dysregulated dopaminergic system in the pathophysiology of TS is based on clinical evidence that antagonism of the DA system improves tics.25 Therefore, DA antagonists such as the selective D2R antagonist Tia was recommended as a first-line treatment of TS in Europe.54 Meanwhile, a widespread interaction between DA and GLU systems has been reported. A recent study showed that intraventricular injection of DA increased the GLU levels in the brain of rats using cerebral microdialysis,55 whereas glutamate antagonist (phencyclidine) caused schizophrenia-related behavioral deficits due to DA release.56 Our findings demonstrated that Tia treatment downregulated the level of GLU in TS rats, but whether it regulates the GLU system directly or influences the DA system to improve glutamate metabolism is a question that needs to be further verified. JPZDD is a TCM that was found to possess curative effects and good safety in TS.20 Although there was no difference in efficacy between JPZDD and Tia, JPZDD was also an alternative treatment for TS patients who were intolerant with Tia or other oral medicines because of relevant side effects, such as extrapyramidal symptoms, drowsiness, and hyperprolactinemia. Consistent with our previous studies,21–23 this study further revealed the anti-tics effects of JPZDD on IDPN-induced TS in rats. The present results confirmed that JPZDD decreased GLU concentration in the striatum of TS rats, which was consistent with previous findings using a microdialysis technique in vivo.23 This is likely due to the upregulation of EAAT1 and downregulation of VGLUT1 expression, hence normalizing the transportation of GLU. However, there are some limitations to this study. First, only EAAT1 and VGLUT1 were investigated in this study, but the role of other members of EAATs and VGLUTs in TS was not investigated. Second, JPZDD improved the transportation of GLU, but we did not explore whether it affects the GLU receptors and its downstream signal transduction pathways. These questions need to be answered in further studies. Abnormal expression of EAAT1 and VGLUT1 disrupted GLU concentration, transportation, and metabolism, resulting in excessive accumulation of GLU in the synaptic cleft, which in turn induced glutamate excitotoxicity and plays a role in the physiopathological mechanism of TS. The mechanism by which JPZDD alleviated behavioral dysfunction of TS rats may be associated with maintaining normal GLU transport by upregulating EAAT1 and downregulating VGLUT1 in the striatum. This work was funded by grants from National Natural Science Foundation of China (No 81273799) and Beijing Natural Science Foundation (No 7182101). Wenjing Yu and Xiaowei Shi performed the experiment, data analyses, and graphics production and wrote the manuscript. Xia Cui, Yan Niu, Wen Zhang, Xue Bai, Qian Wang, and Lijun Hu helped to perform the experiment and data analyses. Sumei Wang conceived and designed the experiment, provided finance and technology support, and guided and revised the manuscript. All authors contributed to data analysis, drafting or revising the article, gave final approval of the version to be published, and agree to be accountable for all aspects of the work. Cavanna AE. Gilles de la Tourette syndrome as a paradigmatic neuropsychiatric disorder. CNS Spectr. 2018;23(3):213–218. Robertson MM, Eapen V, Cavanna AE. The international prevalence, epidemiology, and clinical phenomenology of Tourette syndrome: a cross-cultural perspective. J Psychosom Res. 2009;67(6):475–483. Scharf JM, Miller LL, Gauvin CA, Alabiso J, Mathews CA, Ben-Shlomo Y. Population prevalence of Tourette syndrome: a systematic review and meta-analysis. Mov Disord. 2015;30(2):221–228. Hallett M. Tourette Syndrome: Update. Brain Dev. 2015;37(7):651–655. Eapen V, Cavanna AE, Robertson MM. Comorbidities, social impact, and quality of life in Tourette syndrome. Front Psychiatry. 2016;7(1):97. Ganos C, Tics GC. Tics and Tourette’s: update on pathophysiology and tic control. Curr Opin Neurol. 2016;29(4):513–518. Wadman R, Glazebrook C, Beer C, Jackson GM. Difficulties experienced by young people with Tourette syndrome in secondary school: a mixed methods description of self, parent and staff perspectives. BMC Psychiatry. 2016;16:14. Rizzo R, Gulisano M, Martino D, Robertson MM. Gilles de la Tourette syndrome, depression, depressive illness, and correlates in a child and adolescent population. J Child Adolesc Psychopharmacol. 2017;27(3):243–249. Kumar A, Trescher W, Byler D. Tourette syndrome and comorbid neuropsychiatric conditions. Curr Dev Disord Rep. 2016;3(4):217–221. Harris K, Singer HS. Tic disorders: neural circuits, neurochemistry, and neuroimmunology. J Child Neurol. 2006;21(8):678–689. Singer HS, Morris C, Grados M. Glutamatergic modulatory therapy for Tourette syndrome. Med Hypotheses. 2010;74(5):862–867. Adamczyk A, Gause CD, Sattler R, et al. Genetic and functional studies of a missense variant in a glutamate transporter, SLC1A3, in Tourette syndrome. Psychiatr Genet. 2011;21(2):90–97. Ramamoorthi K, Lin Y. The contribution of GABAergic dysfunction to neurodevelopmental disorders. Trends Mol Med. 2011;17(8):452–462. de Leeuw C, Goudriaan A, Smit AB, et al. Involvement of astrocyte metabolic coupling in Tourette syndrome pathogenesis. Eur J Hum Genet. 2015;23(11):1519–1522. Shigeri Y, Seal RP, Shimamoto K. Molecular pharmacology of glutamate transporters, EAATs and VGLUTs. Brain Res Brain Res Rev. 2004;45(3):250–265. Choi DW. Glutamate neurotoxicity and diseases of the nervous system. Neuron. 1988;1(8):623–634. Hayashi MK. Structure-function relationship of transporters in the glutamate-glutamine cycle of the central nervous system. Int J Mol Sci. 2018;19(4):1177. Yu W, Bai X, Zhang W. Effects of Jianpi Zhi Dong Decoction on the neurotransmitters of tourette syndrome children. Chin J Tradit Chin Med and Pharm. 2015;30(05):1757–1761. Wang DH, Li W, Liu XF, Zhang JM, Wang SM. Chinese medicine formula “Jian-Pi-Zhi-Dong Decoction” attenuates tourette syndrome via downregulating the expression of dopamine transporter in mice. Evid Based Complement Alternat Med. 2013;2013:385685. Zhang W, Yu W, Wang D, Wei L, Lee M, Wang S. Effect of “Jian-Pi-Zhi-Dong Decoction” on gamma-aminobutyric acid in a mouse model of tourette syndrome. Evid Based Complement Alternat Med. 2014;2014(4):1–7. Zhang W, Wei L, Yu W, et al. Effect of Jian-Pi-Zhi-Dong Decoction on striatal glutamate and γ-aminobutyric acid levels detected using microdialysis in a rat model of Tourette syndrome. Neuropsychiatr Dis Treat. 2016;12:1233–1242. Felling RJ, Singer HS. Neurobiology of tourette syndrome: current status and need for further investigation. J Neurosci. 2011;31(35):12387–12395. Kanaan AS, Gerasch S, García-García I, et al. Pathological glutamatergic neurotransmission in Gilles de la Tourette syndrome. Brain. 2017;140(1):218–234. Bronfeld M, Israelashvili M, Bar-Gad I. Pharmacological animal models of Tourette syndrome. Neurosci Biobehav Rev. 2013;37(6):1101–1119. Godar SC, Mosher LJ, Di Giovanni G, Bortolato M. Animal models of tic disorders: a translational perspective. J Neurosci Methods. 2014;238:54–69. Zhao L, Qi F, Zhang F, et al. Dual regulating effect of Ningdong granule on extracellular dopamine content of two kinds of Tourette’s syndrome rat models. Biosci Trends. 2015;9(4):245–251. Diamond BI, Reyes MG, Borison R. A new animal model for Tourette syndrome. Adv Neurol. 1982;35:221–225. Marmiroli P, Cavaletti G. The glutamatergic neurotransmission in the central nervous system. Curr Med Chem. 2012;19(9):1269–1276. Fogarty MJ. Driven to decay: excitability and synaptic abnormalities in amyotrophic lateral sclerosis. Brain Res Bull. 2018;140:318–333. Wang SJ, Yang TT. Role of central glutamatergic neurotransmission in the pathogenesis of psychiatric and behavioral disorders. Drug News Perspect. 2005;18(9):561–566. Jenson CE. Tourette syndrome: a bizarre and frightening neurological disorder. J Neurosci Nurs. 1988;20(4):213–216. Strømmen K, Haag A, Moltu SJ, et al. Enhanced nutrient supply to very low birth weight infants is associated with higher blood amino acid concentrations and improved growth. Clin Nutr ESPEN. 2017;18:16–22. Blum F. High performance liquid chromatography. Br J Hosp Med. 2014;75(2):C18–C21. Janik P, Kalbarczyk A, Gutowicz M, Barańczyk-Kuźma A, Kwieciński H. The analysis of selected neurotransmitter concentrations in serum of patients with Tourette syndrome. Neurol Neurochir Pol. 2010;44(3):251–259. Hinoi E, Takarada T, Tsuchihashi Y, Yoneda Y. Glutamate transporters as drug targets. Curr Drug Targets CNS Neurol Disord. 2005;4(2):211–220. Hardingham GE, Bading H. Synaptic versus extrasynaptic NMDA receptor signalling: implications for neurodegenerative disorders. Nat Rev Neurosci. 2010;11(10):682–696. Tzingounis AV, Wadiche JI. Glutamate transporters: confining runaway excitation by shaping synaptic transmission. Nat Rev Neurosci. 2007;8(12):935–947. Paddock SW, Eliceiri KW. Laser scanning confocal microscopy: history, applications, and related optical sectioning techniques. Methods Mol Biol. 2014;1075:9–47. Gadea A, López-Colomé AM. 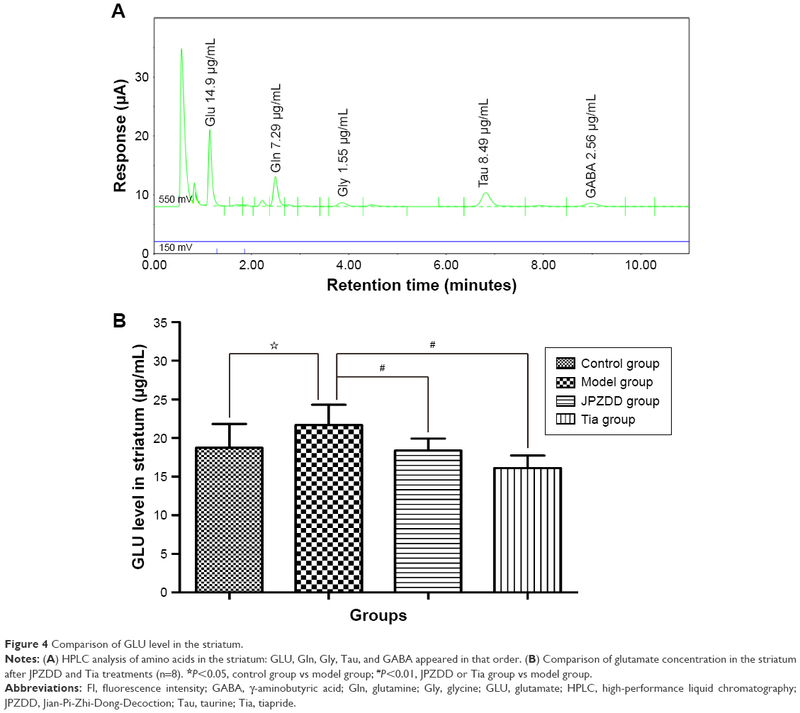 Glial transporters for glutamate, glycine, and GABA III. Glycine transporters. J Neurosci Res. 2001;64(3):218–222. Bellocchio EE, Reimer RJ, Fremeau RT, Edwards RH. Uptake of glutamate into synaptic vesicles by an inorganic phosphate transporter. Science. 2000;289(5481):957–960. Zhao Q, Xie S, Sun Y, et al. Development and evaluation of a SYBR Green real-time RT-PCR assay for detection of avian hepatitis E virus. BMC Vet Res. 2015;11:195. Storck T, Schulte S, Hofmann K, Stoffel W. Structure, expression, and functional analysis of a Na(+)-dependent glutamate/aspartate transporter from rat brain. Proc Natl Acad Sci U S A. 1992;89(22):10955–10959. O’Shea RD. Roles and regulation of glutamate transporters in the central nervous system. Clin Exp Pharmacol Physiol. 2002;29(11):1018–1023. Nakagawa T, Kaneko S. SLC1 glutamate transporters and diseases: psychiatric diseases and pathological pain. Curr Mol Pharmacol. 2013;6(2):66–73. Barr CL, Wigg KG, Pakstis AJ, et al. Genome scan for linkage to Gilles de la Tourette syndrome. Am J Med Genet. 1999;88(4):437–445. Tourette Syndrome Association International Consortium for Genetics. Genome scan for Tourette disorder in affected-sibling-pair and multigenerational families. Am J Hum Genet. 2007;80(2):265–272. Tanaka K. Glutamate transporter dysfunction and major mental illnesses. Nihon Rinsho. 2016;74(1):163–173. Fremeau RT, Voglmaier S, Seal RP, Edwards RH. VGLUTs define subsets of excitatory neurons and suggest novel roles for glutamate. Trends Neurosci. 2004;27(2):98–103. Herman MA, Ackermann F, Trimbuch T, Rosenmund C. Vesicular glutamate transporter expression level affects synaptic vesicle release probability at hippocampal synapses in culture. J Neurosci. 2014;34(35):11781–11791. Granseth B, Andersson FK, Lindström SH. The initial stage of reversal learning is impaired in mice hemizygous for the vesicular glutamate transporter (VGluT1). Genes Brain Behav. 2015;14(6):477–485. Gilabert-Juan J, Varea E, Guirado R, Blasco-Ibáñez JM, Crespo C, Nácher J. Alterations in the expression of PSA-NCAM and synaptic proteins in the dorsolateral prefrontal cortex of psychiatric disorder patients. Neurosci Lett. 2012;530(1):97–102. Roessner V, Schoenefeld K, Buse J, Bender S, Ehrlich S, Münchau A. Pharmacological treatment of tic disorders and Tourette Syndrome. Neuropharmacology. 2013;68:143–149. Wen FF, Xu Z, Liu LP, Yang JJ, Ding SD. Effect of dopamine on intracerebral glutamate uptake ability in rats with minimal hepatic encephalopathy and the pathogenesis of minimal hepatic encephalopathy. Zhonghua Gan Zang Bing Za Zhi. 2018;26(1):48–53. Gupta I, Young AMJ. Metabotropic glutamate receptor modulation of dopamine release in the nucleus accumbens shell is unaffected by phencyclidine pretreatment: In vitro assessment using fast-scan cyclic voltammetry rat brain slices. Brain Res. 2018;1687:155–161.